Baraje pointed to the withdrawal of the security aides of the Senate President, Dr Bukola Saraki, and his House of Representatives counterpart, Yakubu Dogara, by the Presidency at the weekend barely a few days after their meeting with Vice President Yemi Osinbajo on the way forward for the two parties. Baraje raised the alarm that the Federal Government had continued to persecute their members, even while the so-called negotiations were ongoing. The statement said, “The public may recall that there have been ongoing talks between members of the former nPDP, the APC and the Presidency in recent days. “Nigerians may further recall that a team from the former nPDP led by Speaker of the House of Representatives, Yakubu Dogara, and four others, were to meet with the Vice President, Prof, Yemi Osinbajo, today (yesterday). “However, while we are truly and earnestly committed to achieving reconciliation, harmony, truce and cohesion in the APC as we approach the 2019 general elections, it appears that the Presidency is not interested in the talks and that they may have been negotiating in bad faith. “We were alarmed that immediately after our meeting with the Vice President last week, the presidency misrepresented what transpired at the meeting by trying to blackmail some of the principal actors involved in the discussions in a national daily. ‘’Similarly, the leadership of the party went ahead to ratify all the congresses from ward, local governments, states to zonal, where many of our members have complaints, effectively presenting us with a fait accompli. “The persecution of our members using state security apparatus has continued unabated. “We recognize the powers of the police to conduct criminal investigations but by rushing to the public with the issue, even when they have unfettered access to the leadership of the National Assembly, suggests an attempt to undermine, caricature and humiliate the institution of the legislature. 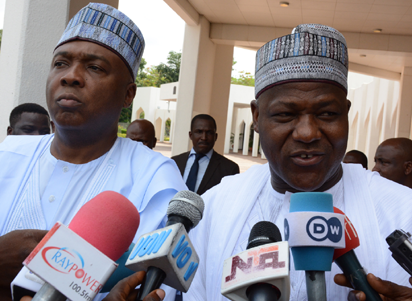 “It appears that there is a fouled and toxic atmosphere and environment of intimidation and threat to life in which we now find ourselves, which may no longer be conducive for members of the former nPDP to continue with the talks, given the unfolding events in the last 24 hours, where the President of the Senate, Dr. Abubakar Bukola Saraki, and Alhaji Abdulfatah Ahmed, the governor of Kwara State, both of whom attended the meeting with the Vice President on Monday, May 28, 2018, have suddenly been accused of sponsoring armed robbery by the police under the directives of the Presidency. “Similarly, on Saturday, June 2nd, 2018, the Department of State Services, DSS, also suddenly withdrew more than half of all the security details attached to the presiding officers of the National Assembly under questionable circumstances.